Pollution can come from nature, but is mostly produced by humans. It is a problem that requires rapid solutions, both within Australia and internationally, due to the growing human population and the increase in size of cities. 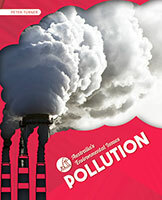 Pollution explores the problem, as well as explaining the steps that need to be taken to combat it. Australia is currently facing several significant environmental issues. The Australia's Environmental Issues series provides an overview of environmental issues affecting Australians and our environment. Each title in the series outlines the cause of the issue and focuses on solutions.